Mayor Rahm Emanuel is pledging to bring safety and security to every neighborhood if he wins reelection. CHICAGO (WLS) -- Mayor Rahm Emanuel is pledging to bring safety and security to every neighborhood if he wins reelection. 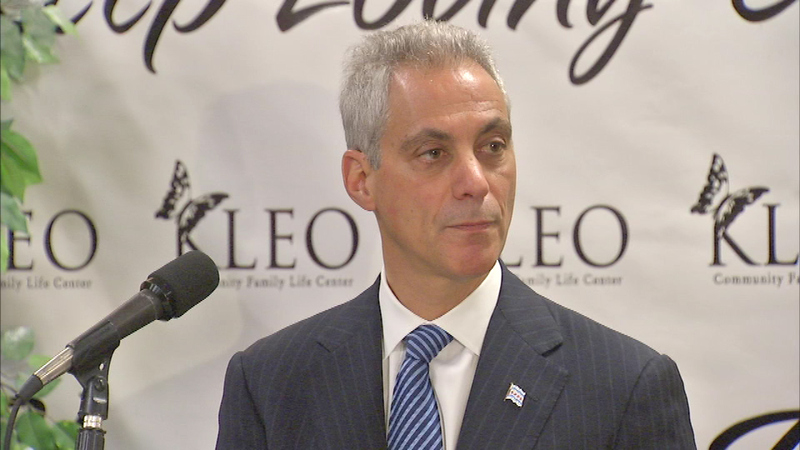 Emanuel spoke Tuesday at a community center in the city's Washington Park neighborhood. The mayor says he wants to use every possible strategy to reduce murders and violent crimes. That plan would include more police officers, more body cameras for officers and more programs for at-risk kids. "Too many families still have their kids off the porch when it gets dark," Emanuel said. "Too many families and too many parents do not let their kids go outside because they are scared. We will not rest, we cannot rest, until every parent in every part of this city enjoys the same sense of security that others experience and have come to expect." All five Chicago mayoral candidates will take part in a debate on February 5th that ABC7 is hosting in partnership with Univision and the League of Women Voters.